I have made this cake for many special occasions. A little lace and ribbon and voilà! It’s gorgeous! From 4 Ingredients Chocolate, Cakes & Cute Things. You can find Turkish Delight (which is a common confection in Australia and part of our Rocky Road) online. Line the bottoms of two 4-inch cake pans with wax paper. In a microwaveable bowl, melt the chocolate on medium power in 30-second increments, stirring after each, until smooth and creamy. Allow to cool for 5 minutes, then stir in the remaining ingredients, mixing well to combine. Divide the mixture evenly between the two pans and refrigerate until set. Slice to serve. 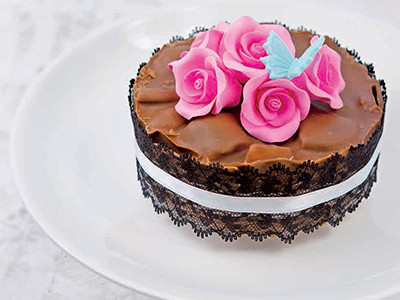 Rather than two smaller cakes, make one bigger using an 8-inch cake pan. Substitute red jellies or jujubes if you can’t find Turkish Delight. 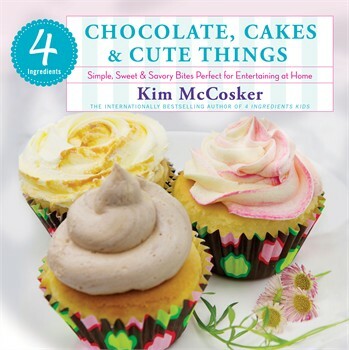 The internationally bestselling author of the sensational 4 Ingredients series is back with super easy sweets and treats that look and taste like four-star creations, all using 1-2-3 . . . 4 ingredients!